Singer-guitarist Kinoshita Riki first started out as a solo artist from Osaka but then decided to try his hand at forming a band. He asked his supporting musicians at the time -- bassist Hinata Hidekazu and drummer Sakurai Yuuichi -- to join. Kinoshita later met guitarist Ooyama Jun and recruited him for the band. Art-School was born. 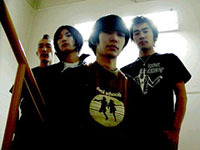 The band played its first gig at the Shitakitazawa Shelter in 2000 and eventually garnered a loyal following, drawn by Art-School's powerful live show and Kinoshita's enigmatic character. After releasing a number of independent mini-albums, Art-School attracted the attention of Toshiba-EMI, who signed the band in 2002. January 2003 found the group with its first sold out tour. By the end of 2003, Hinata and Ooyama announced their intention of leaving. Ooyama cited fatigue as his reason for departure, while Hinata wanted to pursue other projects. Hinata has since joined ex-Number Girl Mukai Shuutoku's band, Zazen Boys. Kinoshita and Yuuichi started a search for a new bassist in 2004, and in March of that year, Art-School welcomed two new members: guitarist Tokada Kenji and bassist Uno Takeshi. Art-School released a pair of special limited edition EPs through Tower Records, and in 2005, the band announced it was switching labels to Pony Canyon. For its third full-length album, the band recorded with producer Tony Lanegan and collaborated with ACO and members of Mogwai and the Delgados.